Look glamorous with this designer black rich jute blazer with notch lapel collar enhanced with white bold piping and welt pocket on left chest. It has front opening button along with set buttons on cuff. It is complimented with white pocket square. Note: This Product does not include bottom or anything except blazer. Shoes shown in the image is only for photography purpose. - Men's black hooded 3/4 coat with a belt for all weather. In order to cater the variegated demands of our clients, we are offering an excellent quality range of Check Coat. 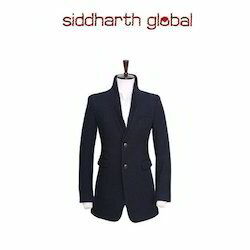 We have carved a niche in this domain for offering Coat For Men to our valued clients. Qualitative range of yarns and latest sewing machines has been taken into use to design this coat. It is the best known for its excellent finishing and matchless quality. Our products price range is within Rs.4000 -Rs.20000. Available 5 colour 3 size.